Here he is, the banner bearer himself. You can click on the images above for larger versions. I know it might seem odd, but I paint the model completely, paint the banner completely and then assemble the two parts in the end. I'm not just teasing you all by leaving the banner off. In a previous post, there was a comment from Sweet Dreams asking about the backpack and getting it attached. The way the model here is posed, his shoulderpads prevent his backpack from sitting flush against his back like it should when attached properly. To fix this, since I didn't have the option of leaving it off or not doing the model all together, was to use a bit of greenstuff. At first, I dug through my bits box and tried a couple of different backpacks. Didn't matter what I grabbed, none of them fit correctly. In the end, I went with the one I picked out originally because I'd already sculpted an icon on it and the mold lines were cleaned off. That's right folks, I am that lazy. All I needed to do was add a small block of greenstuff to the back of the model prior to placing the backpack in position. I put it on the model, used the sculpting tool to square it up and then added some superglue to the backpack itself and pressed everything together. Where the greenstuff was pushed out of shape, I simply squared it back up with the tip of my sculpting tool. It didn't have to be perfect, just enough to sell the illusion (you've heard that before here). Once dry, I left it black so that it dropped out of sight and wasn't very pronounced on the model. Now it blends in, doesn't draw attention and looks "right." I really like the look of this guy, so simply done but it just fits! The person who gets drawn as the army winner will be really happy. And they get double the enjoyment because they know they are helping people too! Excellent model once again. He will be a great addition to the Storm Wardens project! Once again your speed, and moreso, quality are most humbling. Looking good, and it's always nice to see a bits box underdweller get some light-of-day love. Can't wait to see the banner itself! Thanks guys. As of right now, the banner is about 25 percent complete. This is the one place where I custom mix all my colors and do all kinds of blending, so it takes me a bit longer than usual to paint them. Ron, that's not lazy! It's practicing conservation! I have to say I've been watching this whole event as it progresses and there is nothing "lazy" about any of it. It looks amazing and I hope whoever wins cherishes these amazing models! Thanks for taking the time to actually post a reply to my question, it's very much appreciated Ron. No problem, I apologise to all of those I don't get to. I appreciate all the comments and do my best to get back to everyone. 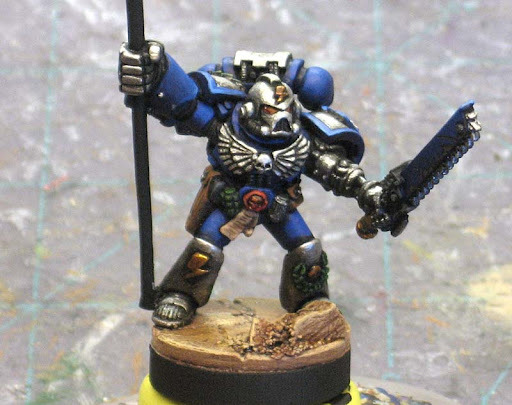 Could you give us some more information about how you did the powerfist holding the banner? 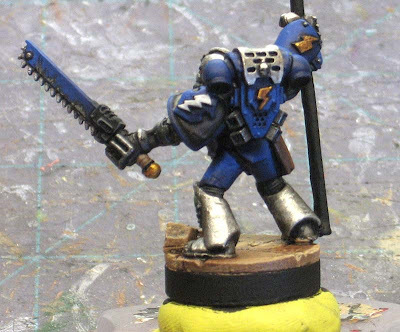 The power fist is part of the model, this is an old 2nd edition metal mini. Old minis rock. Ah I see. 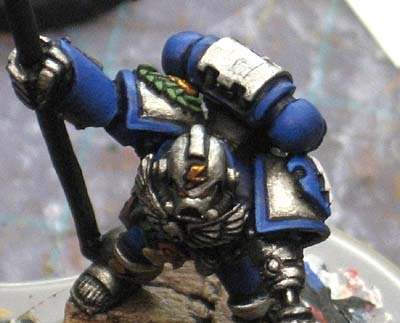 Could it be this space wolf, heavily converted? Or a different mini altogether? Bugger. Screwed the layout a bit, if the mod could remove my previous comment?